The only Amish in New England are found in Maine. Today there are 3 communities in the state. You can read more at the new State Guide entry on Maine Amish, with info on Unity Amish donuts, more Maine Amish photos, the unusual origin story of the Smyrna Amish community, as well as a video on the Fort Fairfield Amish. Amish moving to new areas often do so in search of cheaper land, but many set up small businesses as well, including carpentry crews, small stores, and woodworking shops. Some Amish in Maine have started wood-related businesses; read more about Amish woodcraft in the Pine Tree State: Amish Furniture-Maine. Richard, is any part of your site able to be followed on FB or do you need to access it from an internet site? Enjoy the pictures. Erik, thank you for this site!! Since your a writer Beth, you should do pretty well in this contest.This farm may not be open to the public again much longer for a tour like this, so if it were me i would enter this. Another benefit to this contest is that its an Amish farm now, so your getting kind of 2 tours in one. And Loretta im not on Face book now, i was to be honest but quickly lost interest in that. I can barely find the time to go to the web sites that i visit now.But thank you for asking, and i hope your able to enter this contest. Richard from Lebanon county’s Amish settlement. 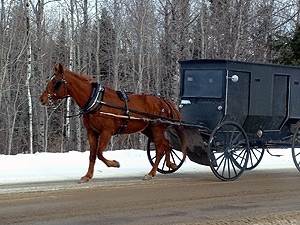 My family and friends in Maine tell me that they come across the Amish occasionally, especially the Presque Isle colony. that is just a few miles from where I live here in Canada. Maybe I’ll be able to get a buggy there when the time comes! I grew up in farming country between Caribou and Presque Isle. Richard, hope the contest goes well! Loretta, thank YOU for paying us a visit! And Magdalena, I was confused for a second, then I realized Presque Isle=Fort Fairfield. Unless they prefer to call themselves Presque Isle, which I wouldn’t be surprised to hear. Thanks Erik, i really would love to tour that farm myself, i may have to enter the contest under another name,lol. Richard . I have a very close friend from Ft. Fairfield. His grampy’s farm was next door to one of the Amish farms, and ever since his grampy passed away the Amish have kept an eye on the property and maintained it, even though the family never asked. They’re very appreciative of the help from the Amish folk in the area since my friend’s family has largely moved out the area. Oakfield, Maine) in The Budget and have always thought it seems like an interesting community, one which is more open than others to non-Amish who are thinking about becoming Amish. The Amish state guide is great resource, and I’m sure it has taken many, many hours to compile. I refer to it quite often and I appreciate your work on it. Is Maryland considered New England? I wasn’t sure but I have a New Order penpal who lives in a community in MD. Kate, Maryland is not considered New England (some people even place it in the South, but I don’t know if I’d agree). New England starts once you get past New York–Connecticut, Mass, and everything past them. Al, I really do appreciate you saying that. True, it has been a pile of work, but rewarding. Slow and steady and it will get done–just 6 more entries to go! I know the Amish people. I know you have pictures, and I am going to just let you know that they do NOT want pictures taken of them or the things they own. Maine does not have 3 areas where Amish reside, there are are 5. And Maine is not the only state in New England. Massachusettes, Connecticut, N.H. and Vermont all have areas as well. There are 45 states in the U.S. with Amish households. Up in Ontario,Canada also has many. This is so you can update your info. Thank you for your point here, But. I have personall talked with 2 BISHOPS in Lancaster, PA on issues as what I have pointed out. I also have spoken in person with federal records on the number of states Amish reside in… same subject as with the old order Bishops. I also spoke to the author of the book: 20 Most Asked Questions about the Amish and Mennonites…. (Merle Good), who grew up with an Amish family. I do not care where you have done your research, but what I was told by Bishops is to go str8 to the soarce, the people in Amish families. They ALL start off with “ABSOLUTELY” No pictures are to be taken. Have you talked the the Gov. of PA? Ther is now a law in Pa for those taking pics or filming Amish. He told me a person caught could see up to 30 years in jail. “Church rights” he calls it. Thanks for the linkage though. I will go and check it out later. To anyone who this fits.. I find it very disrespectful to take pictures of the Amish people, they should have the same kind of respect that we would want… I find the Amish way of life just as interesting as the rest of the world, however you should never cross the line of respect. I think if people find the Amish life that interesting maybe your missing something these kind people have…. I for one would not care to have my life watched day in and day out. The difference is they live a simple life and spend more time with the LORD then any of us do and I can’t help but to say pick up your BIBLE and become friends with JESUS and you will find what your missing!!! Sua didática é muito boa para escrever . Continue assim, estou lendo todos os posts do website.